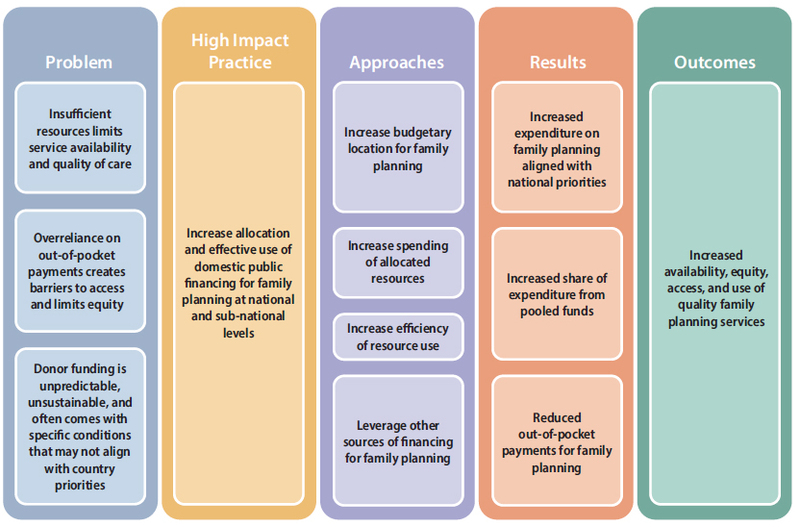 High Impact Practice:Increase allocation and efficient use of domestic public financing for voluntary family planning at national and sub-national levels. Family planning has been shown to be a “best buy” for governments: for each additional dollar spent on contraceptive services in developing countries, the cost of maternal and newborn health care could be reduced by $2.20.1 But in order for voluntary family planning programs to be successful and sustainable, there needs to be strong national capacity to implement and manage programs, including capacity to mobilize and spend the necessary financial resources for family planning commodities, service delivery, demand creation, and training. Domestic public financing is one of several “high impact practices in family planning” (HIPs) identified by a technical advisory group of international experts.2 The purpose of these HIPs is to present the available evidence to support countries in achieving high-quality, voluntary, equitable, and sustainable family planning. For more information about other HIPs, see http://www.fphighimpactpractices.org/overview. Assumption: Family planning services are heavily dependent on donor and/or out-of-pocket expenditures. Why is domestic public financing of family planning important? At the same time, growing populations coupled with higher rates of modern contraceptive use will greatly increase the number of contraceptive users supported by national health systems. Between 2012 and 2017, FP2020 focus countries supported 38.8 million additional modern contraceptive users.5 Yet, in 2017, an estimated 214 million women in low- and middle-income countries still want to limit or spaces births but are not currently using a modern contraceptive method.1 If current trends in increased contraceptive use in 135 low- and middle-income countries continue, the funding gap for commodities alone will be $290 million in 2020 and a cumulative $793 million for 2018–2020, which reflects only a portion of the total cost of providing family planning services.6 Furthermore, countries that rely on donor financing of family planning are already experiencing a decline in donor funding.7 To continue to promote and sustain higher levels of modern contraceptive prevalence, low- and middle-income countries will need to increase the value of domestic public financing for family planning. Inadequate public financing contributes to inequities in access to voluntary family planning services and financial hardship for the poor. The lack of public financing for family planning and limited coverage of prepayment mechanisms means that individuals often rely on out-of-pocket (OOP) expenditure to pay for contraceptives and services. Although mobilizing OOP among groups with the ability to pay is often part of a strategy to support sustainable, domestic financing for family planning, many low- and middle-income countries, including Ethiopia, have acknowledged that “heavy reliance on OOP payments … can make healthcare inaccessible to vulnerable households.”8 The need to pay OOP for contraception can propose a particularly significant barrier for adolescents and women who lack financial autonomy. In 2017, women in low- and middle-income countries spent an estimated $2.09 billion on contraceptive commodities in the private sector.6 OOP expenditure places financial burden on the poor, in particular, and may pose a financial barrier to family planning access. A recent survey of nine countries in Latin America and the Caribbean found that OOP expenditure was a significant source of family planning financing in all seven countries for which data were available.9 In Guatemala, Honduras, and Peru , OOP expenditure accounted for roughly two-thirds of total expenditures on family planning. This implies that even in countries where family planning is theoretically free, there is an overreliance on OOP expenditure. Although there is a dearth of literature examining the effects of OOP expenditure on access to and use of family planning, research indicates that OOP expenditure on health in general can have impoverishing effects on individuals regardless of the country where they live or their income levels.10 This highlights the need to increase financial protection for all health services, including family planning, through increased mobilization and pooling of public funding. What is the evidence that increased domestic public resources are high impact? Although many low- and middle-income countries have yet to transition from donor to domestic financing for family planning, there are encouraging examples of those that have been able to increase the share of domestic public financing for family planning through greater allocations, better execution, and improved efficiency. The following sections present selected examples of successes at the national and sub-national levels. Increased allocation of public revenues to family planning. At the national and local levels, governments have committed budgetary resources to family planning, most commonly for the purchase of contraceptive commodities and supplies. While it is recognized that investments in family planning need to go beyond commodities and supplies to include all core components of an effective program, the examples below reflect the fact that other elements of family planning programs are often not explicitly stated in line-item budgets. Kenya increased its allocation for family planning commodities from $2.5 million in fiscal year 2005/2006 to $6.6 million in 2012/2013, and national government commitments to family planning overall grew to $8.0 million.11 As of 2017, all 47 counties in the country have committed to having a budget line for family planning by 2020. Five districts in Indonesia increased their family planning budget allocations by an average of 76% to a total of $3.6 million between 2014 and 2016.12 In addition, the Government of Indonesia announced significant additional funding assistance for health programs, including family planning, to local governments in its renewed FP2020 commitment in July 2017. Increased execution of funds allocated to family planning. Budget underspending in the health sector is common and estimated to be between 10% and 30% of approved budgets in African countries.14 This represents a missed opportunity to deliver priority programs such as family planning. It also weakens the Ministry of Health’s case for increasing the budget in subsequent years. While advocacy is often targeted at increasing budget allocation, it is critical to also ensure that the allocated budgets are spent fully and on time. There are a wide variety of reasons why execution rates of family planning budgets may be low, including that funds are not released or they are released too late; funds are redirected to other uses; or cumbersome procurement processes cause delays. Tackling these issues often requires changes to the public financial management system and are therefore not usually specific to family planning budgets. Guatemala increased its allocation of public-sector funds for contraceptive procurement from $0.43 million in 2006 to $3.5 million in 2016. Despite an earmarked tax on alcohol to pay for family planning and reproductive health, which raised $4.3 million in 2006 and increased to $7.3 million in 2016,15 use of these funds was difficult to track and they were often used for general programming by the Ministry of Health.16 The creation of a family planning and reproductive health line item and a specific allocation for contraceptives, as well as the creation of the National Commission for Contraceptive Security tasked with tracking the use of family planning spending, increased accountability in the use of these funds. In Swaziland, the Ministry of Health has succeeded in increasing budget execution through routine budget performance monitoring. Through the use of understandable dashboards drawn from routine budget execution information, senior management proactively identify and address underspending. This process informed the reprogramming of funds at the end of the fiscal year 2014/2015 for the purchase of antiretroviral drugs, improving budget utilization from 92% to 98%.17 A similar process could be implemented to address underspending on family planning line items. It should be noted that the above illustrative approaches are not silver bullets and that realizing efficiency gains depends on a range of contextual factors including current contraceptive use dynamics and sexual and reproductive health practices as well as the size and design of family planning programs. Additional financing mechanisms leveraged. Other non-budgetary mechanisms may be used to fund health services, particularly in countries with more developed health financing systems. In these countries, family planning advocates should ensure that family planning has a dedicated financing stream or that contraceptive commodities and services are included within health benefit packages. Include family planning in key strategic documents at the national and sub-national levels. The first step to ensuring that family planning is prioritized in the national budget is to clearly articulate family planning priorities and targets in government policies and strategies, including those focusing on RMNCH. In decentralized health systems, strategies developed at the sub-national level may be more relevant for influencing budget allocations. Set a realistic number of goals with cost estimates. Plans that clearly set out program objectives in a measurable way provide a road map for program implementation. These plans should prioritize high impact interventions and should include a detailed assessment of the funding needed for their implementation and any gaps. The more detailed the costing, the more useful the plan will be to inform domestic financing needs. Costed Implementation Plans (CIPs) are one approach to develop such a plan (see the Tools section below). Develop a clear understanding of the annual budget cycle. 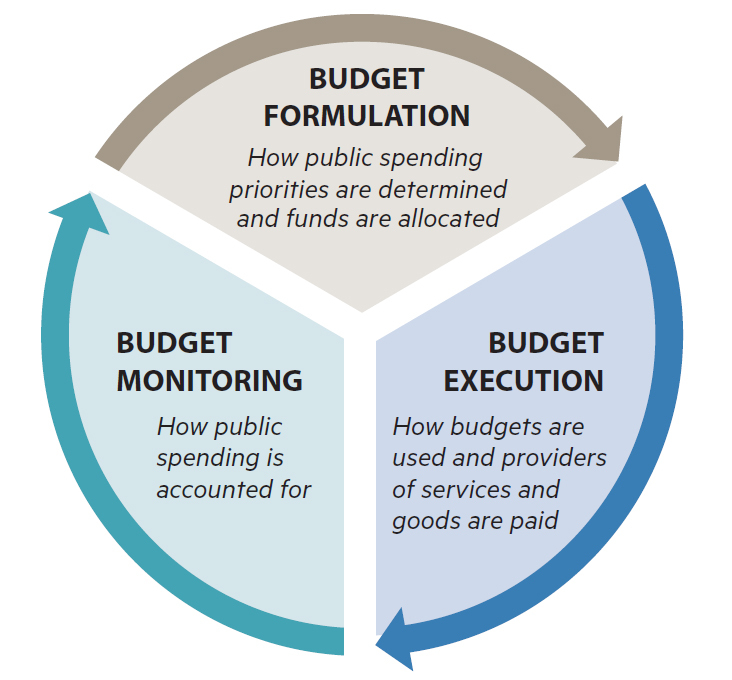 It is important to have a good understanding of each stage of the budget process to be able to identify points in the process at which to most effectively engage with decision makers at national and sub-national levels. At the beginning of the financial year, a budget calendar should be issued outlining the intended timing of each step (see Figure 2). Invest in advocacy to galvanize commitment to family planning. In some contexts, family planning does not appear in the budget and is instead subsumed under one of the other budget line items for health. In such cases, the first step is to advocate for the inclusion of a separate budget line item for contraceptive commodities as this is the easiest way to identify and track family planning investments (see the Galvanizing Commitment HIP brief). Advocacy efforts may focus at the national or sub-national level, depending on the extent of fiscal decentralization in the country. In Nigeria, for example, an analysis of the approved budget for 2017 found that family planning was omitted from the federal budget despite the government’s ambitious FP2020 commitments to invest $11.35 million annually in contraceptive commodities.3 Using these commitments as the focus of messaging, civil society successfully advocated for the reinstatement of this budget line item by participating in the budget hearing and engaging directly with the parliamentary budget committee for health (personal communication, Evidence for Action, 2017). Once the budget line item is included, advocacy efforts can focus on ensuring that the amount allocated is in line with needs and stated priorities. Use your understanding of the political economy to shape how you communicate. When designing your engagement approach, think about who the key decision makers are. What motivates them? What are their interests? What pressures do they face? Who influences them? What is the distribution of power between different actors? Provide sustained pressure over time. Effective advocacy efforts often require multiple engagements so that decision makers fully understand and support the need to invest in family planning. It can also be helpful to engage the media and civil society, ensuring that all advocacy efforts are aligned around the same advocacy ask. For more information, see the Galvanizing Commitment HIP brief. Strengthen public financial management capacity in the health sector. The public financial management (PFM) system refers to the institutions, policies, and processes that govern the use of public funds. Within ministries of health, there is often limited awareness of how PFM processes and reforms can be used to improve program expenditures. PFM reforms such as the move from input- to program-based budgeting (i.e., moving from input line items to budgets based on programs), as well as the establishment of multiyear revenue and expenditure frameworks (i.e., a government-wide spending plan that links policy priorities to macroeconomic and revenue forecasts over a 3–5-year period), if well implemented, can build capacity of health officials beyond the finance unit and gain buy-in for productive engagement in PFM processes. This understanding can help to address some of the blockages in the disbursement of funds. Strengthen dialogue between ministries of health and finance. Establishing more productive engagement between the two government authorities will enable the ministry of health to better take advantage of PFM reforms and to better communicate about sector needs including the need for in-year adjustments to the budget to take advantage of efficiency savings42 as well as how investments in family planning will contribute to economic growth. (See Box on Tips for Advocacy.) The ministry of health can gain the confidence of the ministry of finance by demonstrating that family planning programs are planned and budgeted for based on evidence, that there are systems for monitoring and accountability, and that family planning investments are linked to the government’s midterm expenditure framework. This can help to combat perceptions that the ministry of health is ineffective and inefficient, which often leads to reluctance by the ministry of finance to increase investment in the health sector. Track budgets to assess whether the budget for family planning is being implemented per the approved budget and timelines. Tracking exercises can take on various forms, with the simplest being an annual comparison of the approved/enacted budget to the total spending during the fiscal year. Where actual spending information is available during implementation, through quarterly expenditure reports for example, tracking exercises can be carried out more regularly, allowing discrepancies to be identified as they arise. More extensive tracking exercises, such as a Public Expenditure Tracking Survey (PETS), can be used to track the flow of funds from each level of government in order to identify the bottlenecks in the system. These exercises require primary data collection and a greater understanding of the national PFM system. In addition, Track20 has undertaken Family Planning Spending Assessments in several countries including Bangladesh, Indonesia, Kenya, and Senegal. These assessments collect data on family planning expenditures using a modified version of the National Health Account that focuses strictly on family planning. This brief was written by Thomas Fagan, Sarah Fox, and Shawn Malarcher. It was updated from a previous draft authored by Jay Gribble and Linda Cahaelen. Critical review and helpful comments were provided Moazzam Ali, Michal Avni, Luke Boddam-Whetham, Paata Chikvaidze, Kimberly Cole, Margaret D’Adamo, Arin Dutta, Ellen Eiseman, Jay Gribble, Jeanna Holtz, Roy Jacobstein, Beverly Johnston, Caroline Ly, Alice Payne Merritt, Erin Mielke, Gael O’Sullivan, Tricia Petruney, May Post, Margaret Reeves, Alice Sabino, Amani Selim, Willy Shasha, Martyn Smith, Sara Stratton, Nandita Thatte, and Caitlin Thistle. This brief is endorsed by: Abt Associates, Bill & Melinda Gates Foundation, CARE, Chemonics International, EngenderHealth, ExpandNet, FHI360, FP2020, Georgetown University/Institute for Reproductive Health, International Planned Parenthood Federation, IntraHealth International, Jhpiego, John Snow, Inc., Johns Hopkins Center for Communication Programs, Management Sciences for Health, Marie Stopes International, Options, Palladium, PATH, Pathfinder International, Plan International, Population Council, Population Reference Bureau, Population Services International, Promundo US, Public Health Institute, Save the Children, U.S. Agency for International Development, United Nations Population Fund, and University Research Co., LLC.